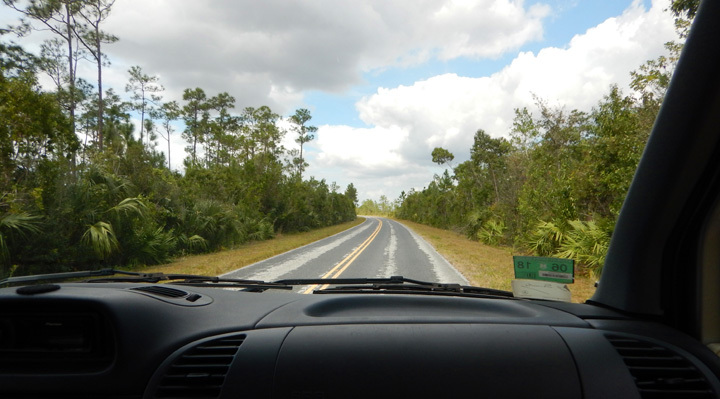 We reluctantly headed north off the keys and took a hard left turn onto Route 9336 into the southeastern section of Everglades National Park. We were excited about meeting up with fellow travelers Keith and Cheryl in Flamingo. We originally made their acquaintance in New Brunswick and Newfoundland, Canada in 2011 and visited them at their home in Denver three years ago. 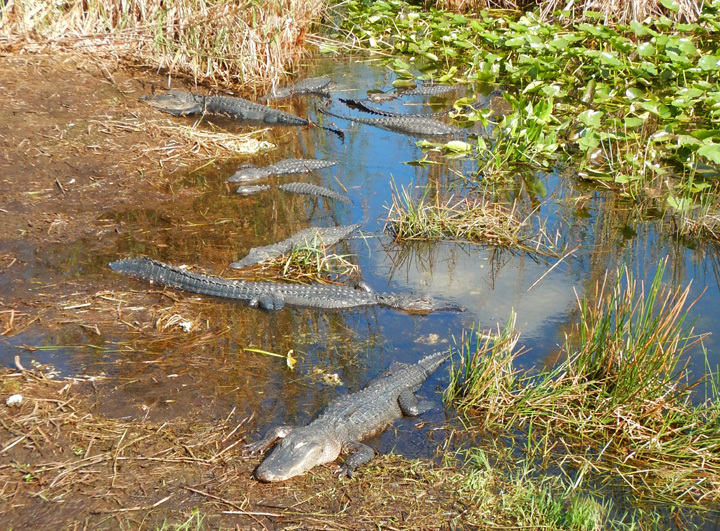 This is all you see if you don’t get out of your car in the Everglades. 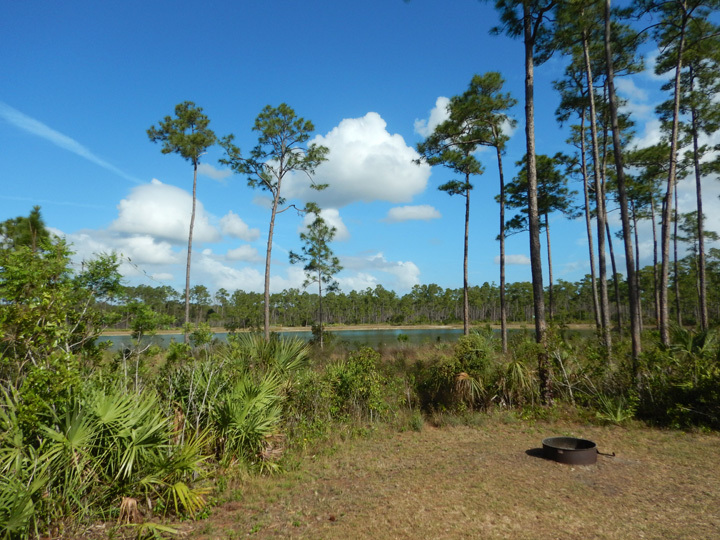 Our beautiful campsite in Long Pine Key Campground. Nice view from haRVy from that same campsite. 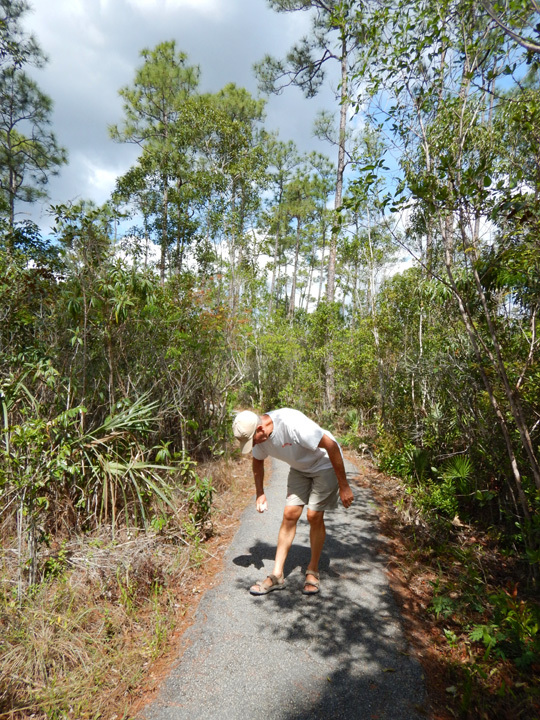 After one night at Long Pine Key we spent a day exploring several short scenic trails along the road from there to Flamingo. Photo above depicts our first indication of the mosquito wars to come. The view from the Pa-hay-okee Lookout is vast. The two photos above are panoramic. Click to see them larger. 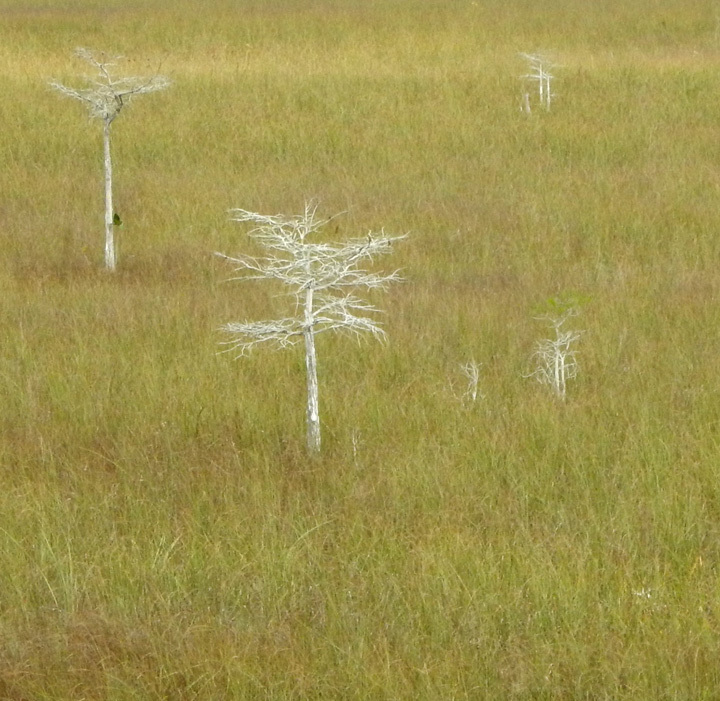 Bald Cypress is a deciduous conifer that grows on saturated and seasonally inundated soils. Florida Bay from Flamingo, where there are no flamingos, only pink buildings. 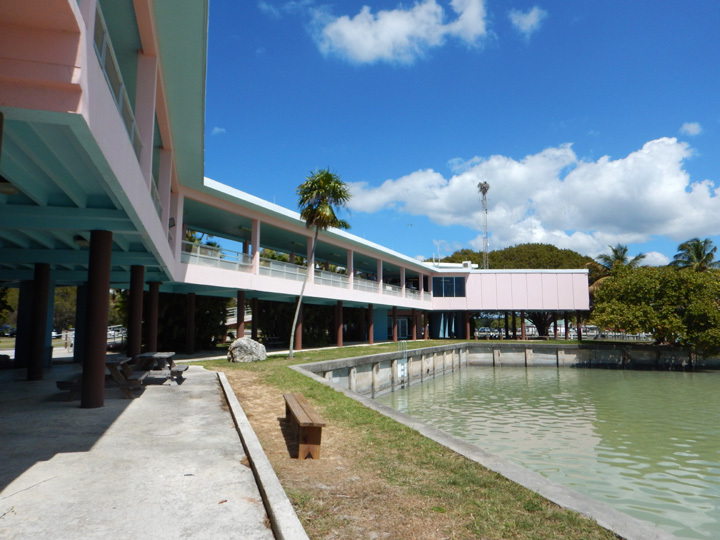 The mid-century modern visitor center that has survived three hurricanes. 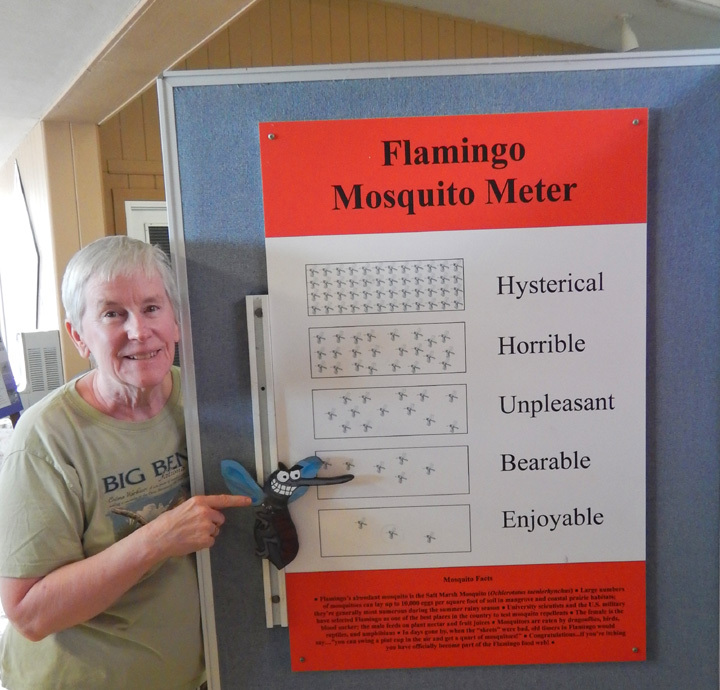 We were happy to see that recent high winds had brought down the level on the Mosquito Meter. The prior week the indicator had been in the hysterical zone. Unfortunately, it did creep back up a bit during our stay. 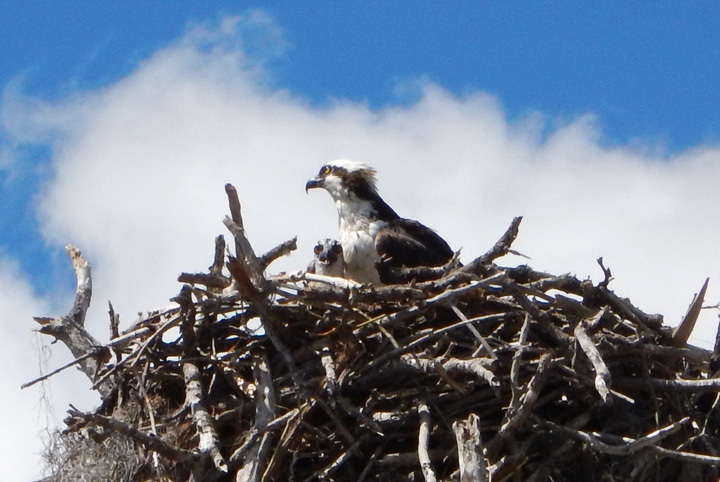 We visited this Osprey family in the campground daily. Not sure why this mockingbird hung out there too. Do they eat fish? You can’t tell in this photo, but the osprey has a fish under his foot that he is tearing apart to feed to his offspring in the nest above. Mother and child. Almost couldn’t believe I got this shot with my little pocket camera. 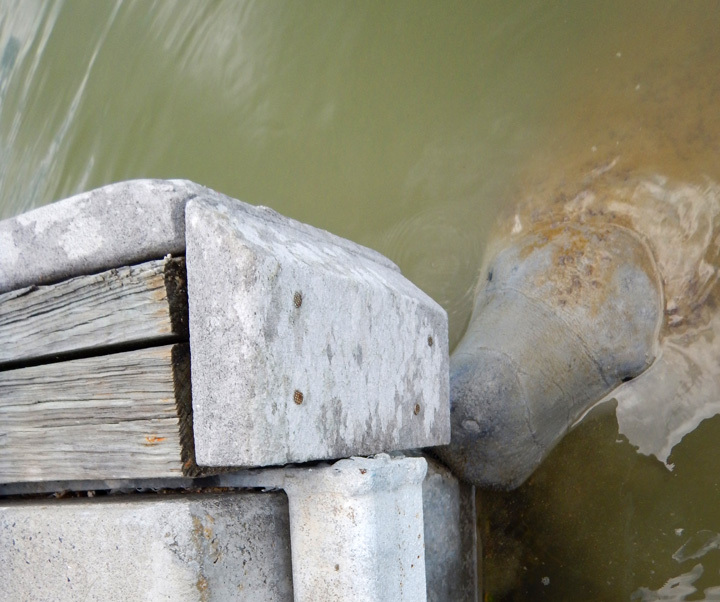 This friendly manatee was eating algae off the marina dock. 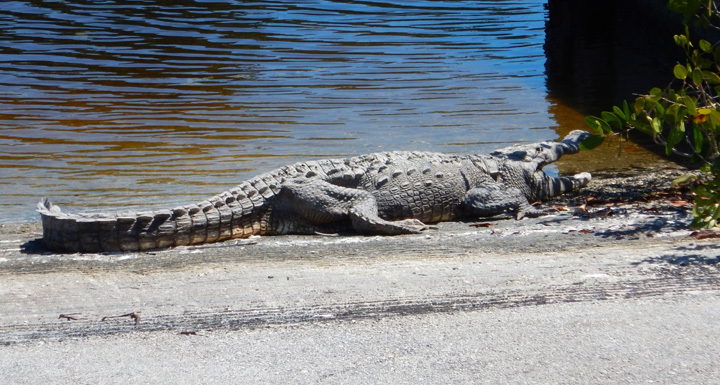 While this rather large crocodile sunbathed on the boat launch ramp. 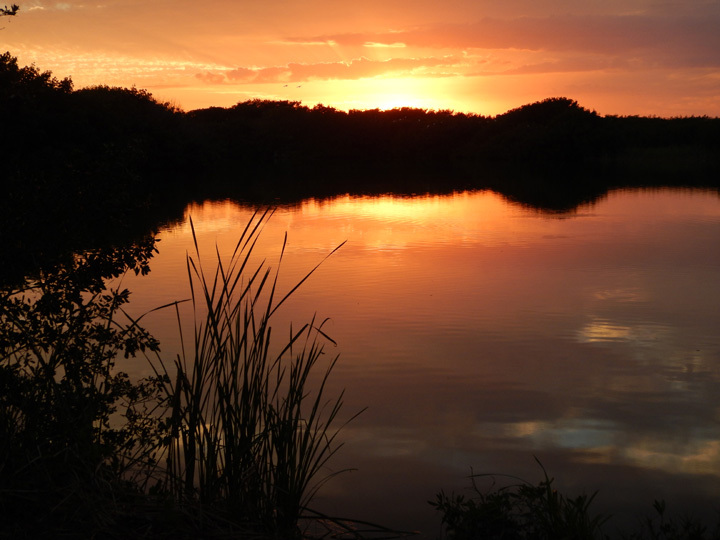 and this beautiful sunset (while beating off hordes of mosquitoes). 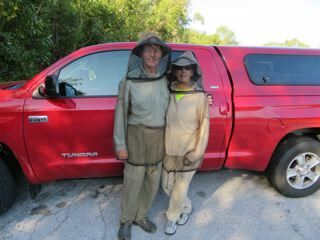 Keith and Cheryl making an Everglades fashion statement. 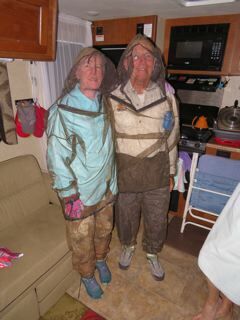 When it became necessary to wear our net bug suits day and night we decided it was time to leave. 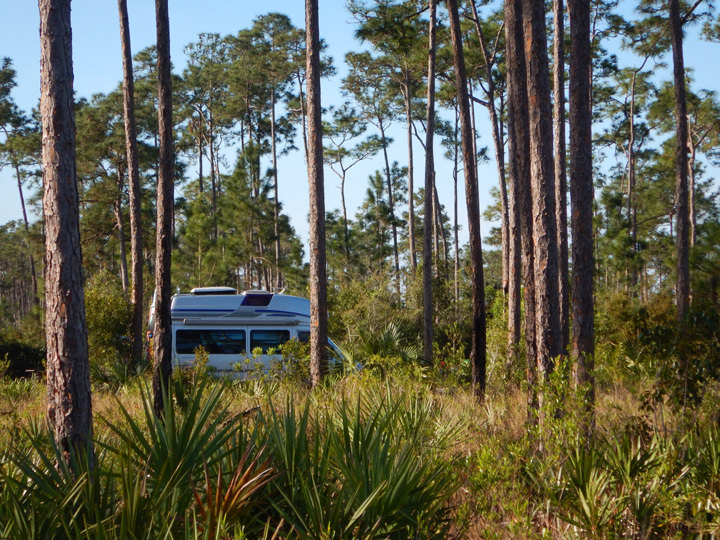 We spent one more night at Long Pine Key with significantly fewer bugs. 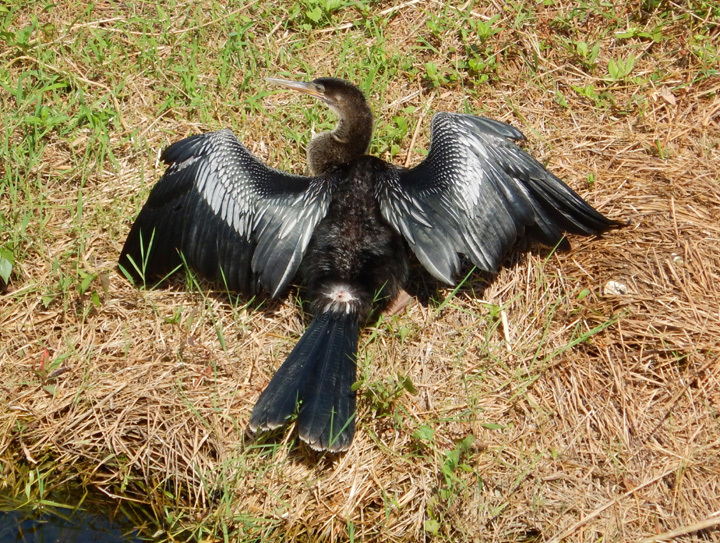 On our way out of the park we hiked the acclaimed Anhinga Trail where we viewed several more examples of the resident wildlife. 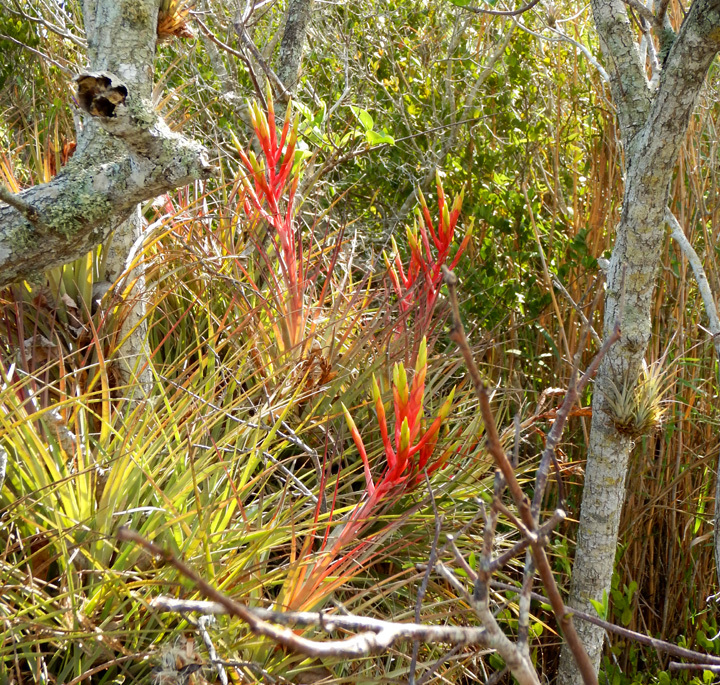 Bromeliads and other air plants becoming more brilliant as spring approaches. Too many alligators to count. 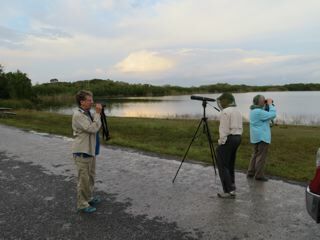 Glad we visited the Everglades in December, no bugs at all ! 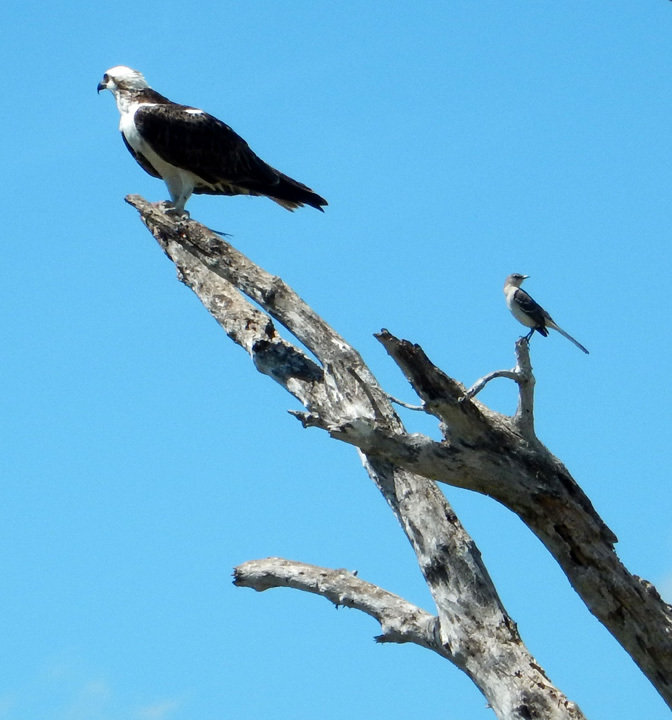 Great wildlife shots, especially the ospreys! My parents told us the native Americans in Everglades said Avon Skin So Soft bath oil is the best mosquito repellent—so we used it often when camping. 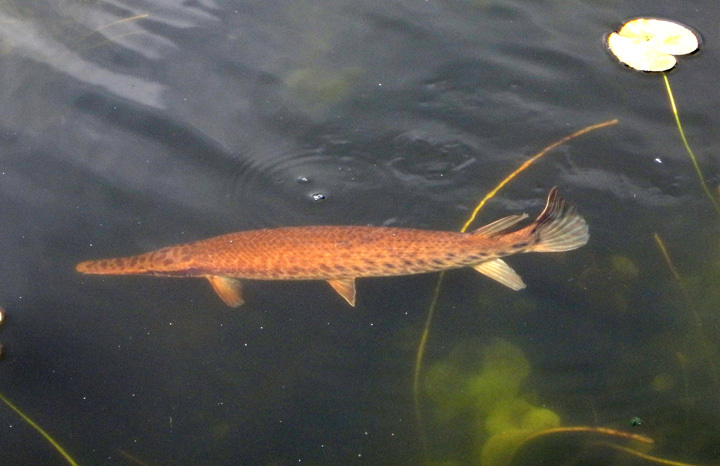 Yes – great photos! 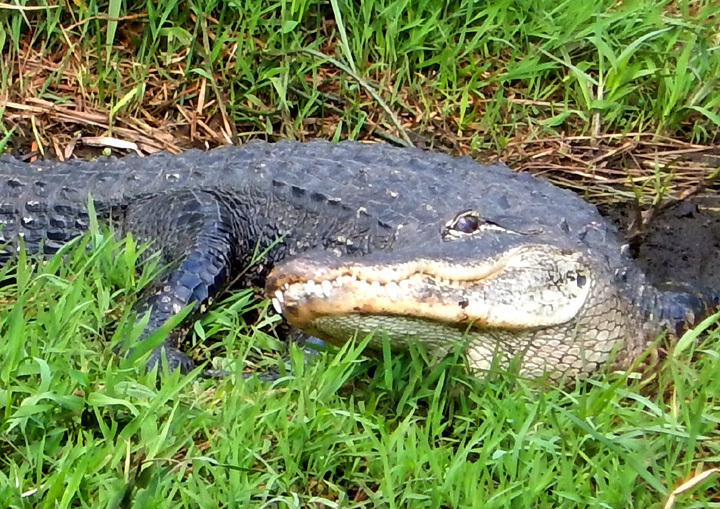 How close were you to those gators? 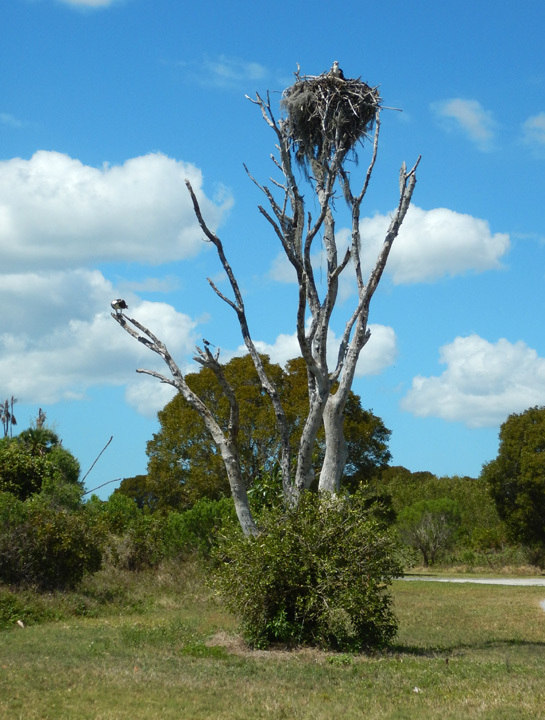 Love the osprey nest. Bald cypress! Who knew? So you really have bug suits! – ugh – definitely time to move on.